3D Cards add a fun interaction between you and your clients. 3D Cards are 3½” x 2″ • Square or Round Corners Available. There are 3 styles of moire, bubble, and serpentine. 10 Mill Transparent Plastic Cards are .010 Mill Plastic Stock, 3½” x 2″ • Square or Round Corners Available. Cards sold in quantities of 100, 250, 500 &amp; 1000 Colors available: Smoke, Red, Blue, Green (1 side is matte finish and 1 side is polished finish. We can print on either side). Mirrored Finish and white backing. Mirrored Finish can be printed on either side. The paper cards offer Heavyweight Cards and Lightweight Cards. The finish is Soft-Touch (feels like a cross between suede and rubber). Heavyweight stock offers Black and White. 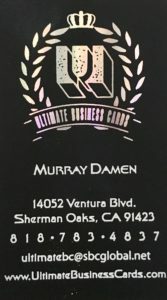 ULTIMATE BUSINESS CARDS 818.783.4837 THE WORLD'S ONLY SUPER BUSINESS CARD STORE.